Free Technology for Teachers: What is BYOD? And Why Do Schools Opt for It? What is BYOD? And Why Do Schools Opt for It? Last week I wrote a post about some of the things that will be taught during the Practical Ed Tech BYOD Camp on July 11th and 12th. 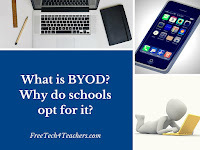 As has been pointed out to me by a handful of people, one thing that I didn't do in that post was explain what BYOD is and why a school might opt for it. Here's my short overview of BYOD. BYOD stands for Bring Your Own Device. You will occasionally hear people use BYOT (Bring Your Own Technology) in place of BYOD. In school settings I've seen BYOD used as a supplement to a school's 1:1 program (programs in which schools provide laptops or tablets to every student) and I've seen it as a replacement for 1:1 programs. In either case students are allowed to bring their personal phones, tablets, and or laptops to use on the school's network. Why do schools opt for BYOD? As mentioned above, some schools will implement BYOD policies as a replacement for maintaining their own 1:1 programs. In a public school setting, that is the worst reason to choose BYOD as it puts students from disadvantaged homes in an inequitable position compared to their classmates. That said, if the choice is BYOD or nothing, I'll take BYOD. Allowing BYOD can be a good way to supplement the 1:1 program a school has in place. Schools will allow students and staff to use their own devices for a variety of reasons including familiarity with a particular operating system, teaching in or attending classes in multiple systems, and making it easier for staff or students to take work with them between home and school. In 2014 my friend Vicki Davis wrote a good piece for Edutopia in which she outlined the challenges of BYOD from an IT management view point. From a classroom teacher's perspective there are some other challenges to worry about in BYOD settings. One of the biggest challenges for teachers in BYOD settings is identifying websites and apps that function correctly across a variety of operating systems and devices. For the most part, when preparing to work in a BYOD setting I look for sites that are written in HTML5. Sites written in HTML5 will function correctly in mobile web browsers as well as in desktop and laptop web browsers. When an HTML5 site isn't available or practical I will search for apps that function correctly on iOS and Android. Generally, I start my search looking on the Android platform first. I start there because there are more Android mobile devices on the market than iOS devices. Register for the Practical Ed Tech BYOD Camp by April 30th and you can save $50 off standard registration. Subscribers to the PracticalEdTech.com newsletter can save an additional $25 by entering the code "subscriber" at checkout. Have a colleague or two who wants to join you? Special rates are available for two or more people registering from the same school district. Email me richardbyrne (at) freetech4teachers.com for details.